For the holiday edition of Business Travel News' monthly cruise feature, we interviewed Nick Wilkinson, vice-president and managing director UK&I and MEA for Norwegian Cruise Lines. There is also a news update on what is happening in the industry, a few cruise bargains, and the result of a visit to Europa 2, Douglas Ward’s top cruise ship. Nick Wilkinson can be best described as a cruise enthusiast with a commercial hat on. 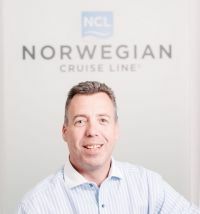 Having worked at Norwegian for 15 years, his passion for travel and cruise has not dwindled. He continues to play a key role in the significant growth of the award-winning operator, spearheading the brand’s sales and marketing direction in what is its largest market outside North America. Wilkinson for one is looking forward to 2018. “A particular exciting year for Norwegian Cruise Lines,” he said. “On 21 April, Bliss leaves for New York and will traverse the Panama Canal before embarking on an Alaska Highlights programme based in Seattle. It is the fourth and final European-style ship in the hugely successful Breakaway Class”. A fifth Breakaway, yet to be named, is under construction at Meyer Werft in Germany, a dedicated ship for the Chinese market. For the future, Norwegian is planning for a new class of ship smaller than the 4,000-passenger Breakaway’s, named project Leonardo. Due for delivery from 2022, these will be of around 140,00grt with a 3,300 capacity, and said to be revolutionary in design. They will be built by Fincantieri in the former STX yard at St Nazaire. In April, Norwegian introduced Premium All Inclusive, in which items formerly classed as ‘extras’ were included in all cruises. Wilkinson describes it as a win-win for both clients and travel agents: More value for passengers and greater flexibility for the trade who can add-on holiday packages at each end of the cruise. Premium All Inclusive includes premium alcoholic and non-alcoholic drinks in all bars, lounges and dining venues at any time throughout the cruise. Unlimited juices, water and soft drinks for children and teenagers. Lavazza coffee specialities during meals. One free bottle of water per person, per day in staterooms. All service charges and gratuities are included. For guests in suites and the very private Haven area, there are further exclusive benefits and privileges. Wilkinson pointed out that the UK was the largest Norwegian market outside North America. Surprisingly, Israel comes in at number six with 85,000 bookings for 2017. For 2018, Jade will again be based at Southampton (see BTN 4 September) with Epic, Spirit and Star operating out of a number of Mediterranean ports. Norwegian’s sister companies are small ship specialist Oceania and very much up-market Regent Seven Seas. All are based in Miami. Europe’s largest cruise show returns to London Olympia on Saturday and Sunday, 17 and 18 February. If you have never been cruising, it is a very good introduction to what is fast becoming the largest specialist sector of the holiday market. Collect all the brochures, listen to the talks, and take advantage of the special offers that can usually be found. Olympia is easy to get to in west London, a short walk from Hammersmith and its transport connections. On Saturday afternoon and Sunday all day, most of the local parking restrictions are lifted. Olympia Station serves both London Overground and Southern, but has limited Underground services. Check before you travel. Highlighted this year is adventure travel, which has grown 65% in the past five years, according to the Adventure Travel Trade Association (ATTA). It is at the top end of the cruising market, still retaining the luxury element, so fewer backpacks and hostels and more 5-star dining with a slice of adventure. For those who love nature and wildlife and are itching to discover properly the destination they’re visiting, expedition cruises allow for more niche, experiential excursions such as hiking, kayaking, and personal encounters with locals. A destination now opening up is Cuba and anyone considering a visit to this unique island should do it quickly before it catches up with the rest of the world. Few places can be considered retro but Havana is, steeped in history and culture and bursting at the seams with vibrant music and salsa dancing. Ships also call at Cienfuegos, a Unesco World Heritage Site, and Santiago de Cuba, home to the best musicians on the island. Cruisers can experience Cuba’s vibrant Latin scene, salsa clubs and of course some local rum. The Tropicana Night Club in Havana has existed for 60 years and been graced by the likes of Ella Fitzgerald, Sammy Davis and Frank Sinatra. The nightly show is breathtaking, with 200 singers, dancers and cabaret acts, plus a splendid orchestra (See BTN 13 January 2014). www.cruiseshow.co.uk Go to this site for discounted tickets at £5 and reader code "Business2018". TILBURY, London’s only cruise terminal with the proposed Greenwich quay waiting for any action, continues to invest in its facilities. The baggage hall is being refurbished and with it the renewal of the roof at a cost of £2.5m. The second part of the landing stage was completed at the end of September, providing for a quay 350m long and 10m deep. Visiting the port this year were Cruise & Maritime Voyages (CMV), with 55 visits out of the total of 64, Voyages to Antiquity with Aegean Odyssey, TUI Cruises and AIDA Cruises. For 2018, 71 are booked, with 2019 also looking promising. On 12 September, TUI Cruises’ Mein Schiff 3 called as part of a seven-night European cruise. The 293m-long vessel carrying 2,700 passengers is the largest the terminal has welcomed to date. With the tender station at Greenwich closed due to high winds, a November a surprise visitor was Europa 2 (See below). HAPAG-LLOYD’S 500-passenger Europa 2 was a surprise visitor to Tilbury last October (See above). The sparse but congenial facilities did not seem to worry the mostly high-worth German holidaymakers, many of whom used the Thames Clipper service to get into town. Europa 2 was on a maiden voyage after an extensive makeover at the Blohm+Voss Hamburg dockyard. The refurbishment of Europa 2 included extensive work to the forward-facing observation lounge at the top of the ship. Called the Belvedere, it was transformed into a coffee bar with a newly-integrated library. Also on Deck 9, the auditorium has been redesigned as a studio for workshops, talks and cinema viewings. Yoga classes can also be held here. Extensive construction work was also carried out in the spa area on Deck 5, with all four saunas being renovated. One is now a Finnish sauna, another is now a Deep Ocean sauna, the third is a herbal sauna with Black Forest-inspired decor and the final one is now a mineral steam bath. The spa area also now has a lounge corner with an electric fireplace, while new lounge furniture has been added to the outdoor area. Elsewhere, the Herrenzimmer gin bar on Deck 4 has been renamed Collins and now features what is claimed the largest gin collection at sea (45 varieties). Opposite, the former Jazz Club has been named Club 2 and more lounge areas added. VIRGIN VOYAGES: The kee- laying ceremony of the first of three new cruise ships that Fincantieri is building for Virgin Voyages (part of Virgin Group) has taken place at Genoa. Watching the proceedings with a keen eye was Richard Branson, founder of Virgin, his sea-going adventures perhaps now forgotten. Also on hand was Tom McAlpin, president and CEO of Virgin Voyages.